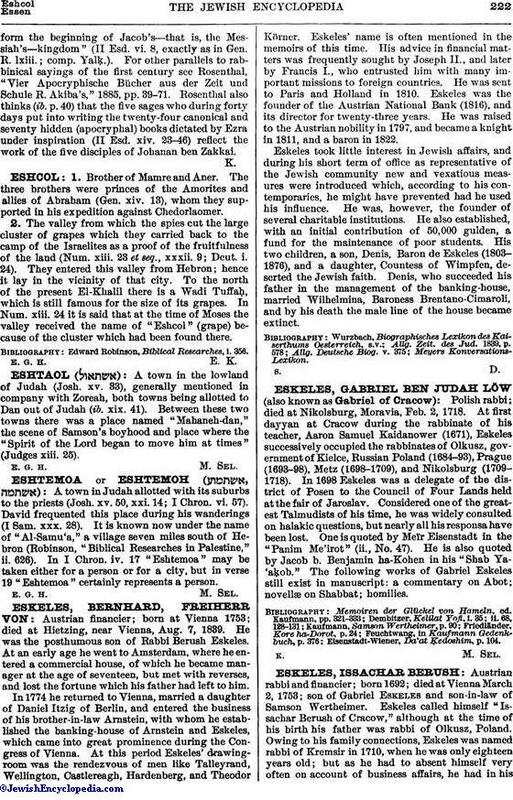 Polish rabbi; died at Nikolsburg, Moravia, Feb. 2, 1718. At first dayyan at Cracow during the rabbinate of his teacher, Aaron Samuel Kaidanower (1671), Eskeles successively occupied the rabbinates of Olkusz, government of Kielce, Russian Poland (1684-93), Prague (1693-98), Metz (1698-1709), and Nikolsburg (1709-1718). In 1698 Eskeles was a delegate of the district of Posen to the Council of Four Lands held at the fair of Jaroslav. Considered one of the greatest Talmudists of his time, he was widely consulted on halakic questions, but nearly all his responsa have been lost. One is quoted by Meïr Eisenstadt in the "Panim Me'irot" (ii., No. 47). He is also quoted by Jacob b. Benjamin ha-Kohen in his "Shab Ya-'aḳob." The following works of Gabriel Eskeles still exist in manuscript: a commentary on Abot; novellæ on Shabbat; homilies. Eisenstadt-Wiener, Da'at Ḳedoshim, p. 104.